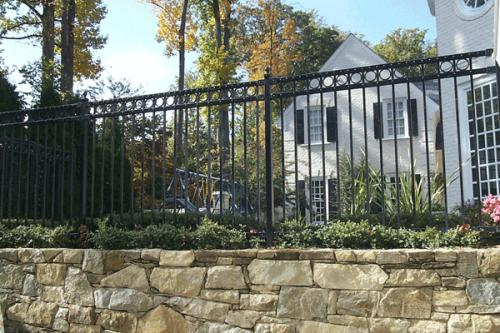 Are you thinking about investing in a metal fence? Every fence is an investment and that means that it will need care from time to time. Summer is a great time to do some heavy duty maintenance on your metal fencing. The weather is nice and the kids are out of school, so you’ll have some helpers. Today we’re going to be talking about the kinds of maintenance that you can do for your metal fencing this summer. Are you ready to learn more? Let’s get going! Keeping metal fencing clean isn’t too hard. We use powder coated finishes on all of our steel fences. This keeps them looking fresh and strong for years, but your fence still might need a little washing now and then. Now, mix some water with a little dish detergent and simply wipe it down. You should also use a wire brush to remove any rust that may have accumulated. Once you’ve finished, you should definitely spray it down with a met primer and then a rust-resistant coat of paint. This will keep your fence looking great longer. You should definitely be inspecting your fence every once in a while, just to make sure that everything looks the way it should. You should check for rust and places in which the metal has bent or warped. If you find yourself with a section of bent fencing, then you should probably call in a professional to take a look at it and tell you the best course of action. There is a high likelihood that you can have it repaired so that you can go back to enjoying your wonderful metal fencing! Do you need some metal fencing for your home in Northern Virginia? This entry was posted on Friday, July 17th, 2015 at 6:57 pm. Both comments and pings are currently closed.